Day 3 is all about the feels! I was supposed to have this done by this morning, but a luncheon thwarted my plans. Perhaps it was silly to think I could commit to every day at breakfast, but at least I’m still actually doing the days, right? So, I’ll continue my commitment to doing one of these posts every day, regardless of the time I’m able to get it done. And again, I’m thinking really hard about making all of my challenges public. It feels so exciting putting all of my hopes and dreams out to the Universe in this manner. It’s like I’m shouting from the virtual rooftops what I want, and that I expect the Universe to deliver! WOOT! 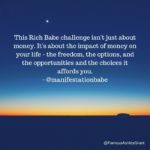 For day 3, the challenge was to list the feelings that I would have if I had an extra $1,000 right now. The idea is to get in tune with the feels related to having what you want now, not the feelings you would have if it’s on its way. If money is just energy, you have to get into the energetic feeling of already having it now so that it can more easily flow to you. For me, if I had an extra $1,000 right now I’d be calmer and relieved. I’d feel a little more free, and a little more happy. And, I’d feel excited about what I’m going to do with the money. You’re supposed to then repeat these feelings to get energetically aligned so the Universe can give you the money! To get into these happy feelings I’m going to visualize the money in my bank account and just feel calm, relieved, happy, free and excited. Along with this 21 day challenge, I’m also reading Catherine Ponder’s The Dynamic Laws of Prosperity. 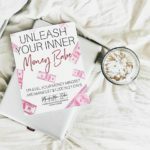 And, in her book she has these awesome money prayers that have been helping me feel more prosperous. Below are a few I’d like to share with you if you too want to feel a little more prosperous right now. There is gold dust in the air – for me. Through definite, deliberate prosperous thinking, I now begin assimilating that gold dust. And even now I am beginning to experience gold dust results. I release, loose, let go and let God. I am the rich child of a loving Father. All that the Father has is mine to share and to experience. Diving Intelligence is now showing me how to claim my own God-given wealth, health and happiness. Divine Intelligence is even now opening the way for my immediate blessings. I have faith that all that is mine by divine right now comes to me in rich abundance. My rich blessings do not interfere with anyone else’s good, since God’s rich substance is unlimited and everywhere for all to use. There is no delay! That which is not for my highest good now fades from me and I no longer desire it. My God-given desires are richly fulfilled now in God’s own wonderful way. Declare: I give thanks for the immediate, complete, divine fulfillment of these desires. This or something better comes forth with perfect timing, according to God’s rich good for me. I am now activated by Divine Intelligence, motivated by Divine Love and guided by Divine Power into my right work, which I perform in a perfect way for perfect pay. The divine plan of my life now takes shape in definite concrete experiences, leading to perfect health, happiness, success and prosperity. Aren’t those just awesome?!? I’m loving getting into my inner woo-woo spiritual side. Some how, some way, this WILL be the year that everything changes for me. My deepest desires are becoming realities, even as I type this now. SOOOOOOOO excited, and feeling so good! Until tomorrow…may your hearts be full and your inner most desires be met!